The Hayes & Stolz Model E-4N Distributor allows venting of displaced air from the product bins back through the distributor to a single filter or collector. 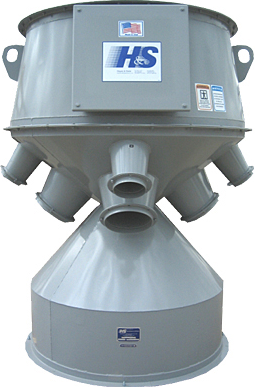 Dust and fines from the filter or collector can then be reintroduced into the product stream or collected in a central dust collection system. An internal rotating air pickup spout rotates with the internal product spout to pickup displaced air from the bin that is being filled. This air pickup spout is connected to a rotating sealed air plenum inside the distributor. The Model E4N is equipped with an electric gearmotor that powers the internal spouts as they rotate to the desired outlet position. The standard sizes for Model E4N Distributors range from 6″ to 48″ diameter inlets/outlets and are available with three (3) to thirty (30) outlets. The angle of the internal spout for flowability is standard at 45°, 50°, 55° or 60°. See Features/Options tab for available options for Hayes & Stolz Model E4N Distributors.